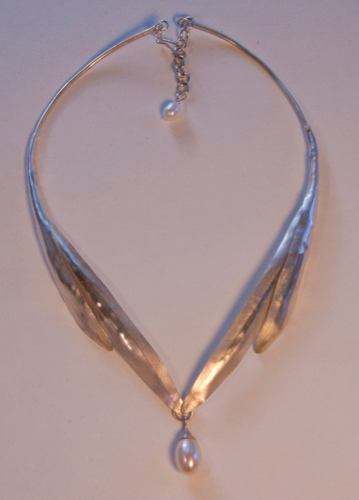 Today, I'm sharing a catch-your-breath jeweler. 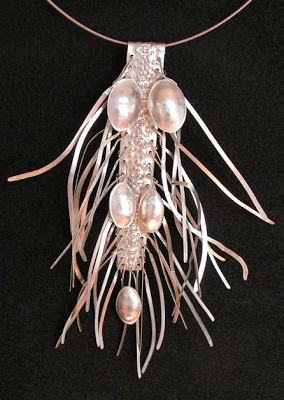 Some months ago, researching Tahitian pearls, I found the online gallery of Sudha Irwin, and return often to meditate on the beauty of her work, especially in pearls. With her permission, I'm showing several pieces. Many evoke a longing I don't often feel. If you're not a pearl person, have a look at the coral, turquoise, tanzanite. 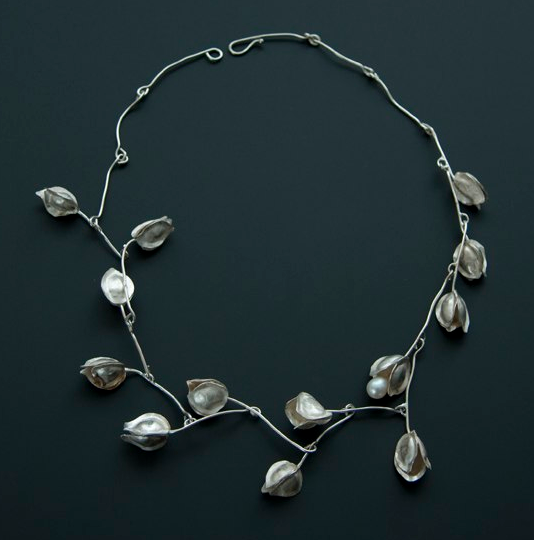 She says, "...my inspiration comes from nature, from my walks along the seashore or the mountain trails near my home"; you will see it in her designs, which seem almost alive. She also said, in a note to me, that "many women carry around an image of themselves that does not reflect who they are now or the changes they have gone through as they have grown and matured." A wise woman as well as masterful jeweler! She is on my Wish List, absolutely. I'm showing several pearl necklaces and pendants; be sure to visit her site to see earrings, rings and bracelets. She creates jewelry to wear everyday, in your real-life clothes, with joy and comfort. Ms. Irwin accepts commissions, preferring, like other artists whom I respect, to work with clients who resonate with her vision. If a pearl (or other gem) project is in your sights, she is one I'd contact. And instead of paying a brand premium for a mass-produced piece, you could enjoy a treasure made by an artist, not a factory. 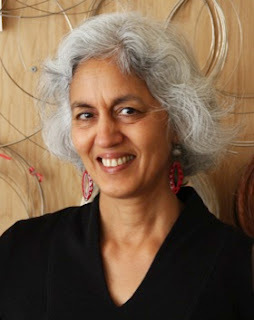 Someday I hope to show you my Sudha Irwin jewel, but I'd be (almost) as happy to admire yours. Beautiful jewelry! Thank you for the introduction. These are lovely, and such a nice variation on a "pearl necklace." I love her quote about carrying an image of oneself, and I think that's so true. OMG thanks SO much for posting. 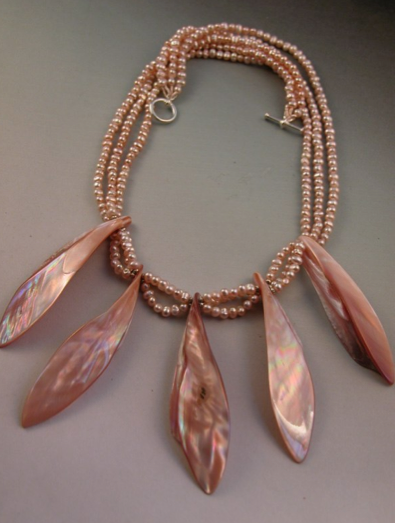 I am always looking for a new way to wear pearls and these are gorgeous!!! Her designs are stunning. 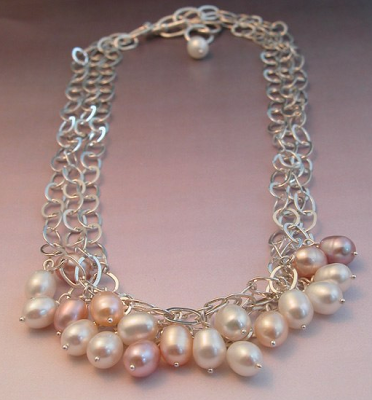 I particularly like the 3 strand chain with the rose pearls. Can a pearl lover ever own too many pearls? I'd love to see what she would create for you! I appreciate your generosity in sharing Irwin's work with all of us. Both, the designer and her beautiful work. You wont find anything like this in my country. All: I underestimated the work re my son's move, but I've read and appreciate every response. It's great to see you back in the Passage. These pieces are stunning and right up my alley. I love the organic quality and the fact that each item has a story. This work makes me want to know the maker. I would like to thank you for your support of these individual artists. Hand made is so much more meaningful than mass produced. For my 60th birthday last year, I got to choose how to spend the day. I chose a long weekend in my favorite city (Santa Fe). I flew into Santa Fe that morning and one of my close friends picked me up at the airport. We had a wonderful lunch together. That afternoon my husband flew in. We had dinner at our favorite restaurant in town and the next day went jewelry shopping. I chose a ring made with an ancient Roman coin and a vintage silver bracelet. Susan: Might this comment be addressing the succeeding post? A warm, personal and delightful set of treats! Wow. These are gorgeous designs, and her quote about women carrying around an outdated image of themselves is true, in my experience. It can be challenging to update yourself though, as you age.